mrae7 has no other items for sale. 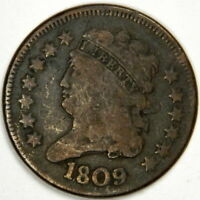 1809 HALF CENT ~ FINE ~ 180 DEGREE ROTATED REVERSE (MEDALLIC ALIGNMENT ERROR)! Thanks for your purchase, we appreciate your business! International buyers and/or buyers bidding or buying multiple items, please wait for our final invoice.